“A man who fights with confidence wins!” saith Uhtred to his grandchildren. So it is in this his latest adventure. If you have been reading this series, the latest tale will not disappoint. If this is the first in the series you will read get ready to go back to the bookstore and purchase the first volume, The Last Kingdom. As the story opens Uhtred, our hero, is reminiscing about an event from his childhood. Three ships, no, it was four ships were seen coming down the coast from the north, and days later his older brother was dead. Within weeks his father was as well. These first short paragraphs grip the reader’s attention. You will want to see what happens next. Cornwell does not disappoint! 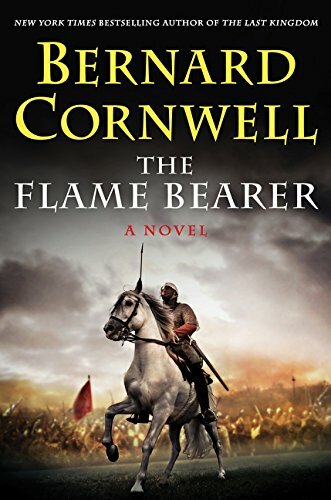 As with all his previous books Cornwell grabs your attention right off the bat. His masterful style pulls you right in. You cannot wait to see where he is going to take you. Even if you have read the other volumes in this series you cannot be sure the path you go down is the one you expected. Before you know it you are somewhere else. You when you realize what has happened you might well want to go back several pages to try and figure out what tidbit or hint you missed. All too often you did not miss anything; he has merely switched gears. That is why Bernard Cornwell is one of the best writers of historical fiction. He sets the narrative within an actual historical setting. There is enough real factual information present for you to conclude that the events really happened. Yet at the same time you know the story, or at least part of it, is fiction. This book is well worth the read. There is mystery, adventure, tenderness, barbarity, excitement, and intrigue between the covers. To help you along there is a nice map. You might want to copy it so you can refer to it more easily. You will probably consult it frequently. There is a Place Names section that you will find helpful as well. But what about the tale you might ask? How much can one say about it without giving it away? One does not want to spoil the story, does one? Perhaps a hint or two will entice you to read The Flame Bearer. The title itself should be sufficient. Sigtryggr’s Northumbria is invaded. “Lo que brilla no es oro,” as Cervantes once wrote. Why is Einar the White also called the Einar the Unfortunate? Who is this guy anyway? The Scots, oh the Scots are at it again! Do the Christians finally subdue the Danes and Norsemen? Ah the Mad Bishop, Ieremias, is up to no good again—double crossing and triple crossing anyone and everyone. But he has a goal and that is to rebuild the monastery on Lindisfarena. Does he strike a deal with someone and realize his dream? Ieremias, however, is not the only one who double crosses others. You need to read the book to find out who does what to whom. Does Uhtred finally capture Bebbanburg? Maybe, maybe not. This much we know for certain: Uhtred is an honorable man who keeps his promises. Uhtred is a great warrior. Uhtred is a superb leader. Uhtred is also cunning. The 10th episode of The Saxon Tales is as riveting as the previous nine, but will there be an 11th? The answer is yes, because Cornwell tells us so in the Epilogue. The question is, will the focus be on capturing Bebbanburg; looking after AEthelflaed’s daughter; or his unfinished business with AEthelstan? We’ll just have to wait and see. Let us hope the next volume comes out soon!